Visible and near-infrared spectroscopic observations carried out on August 1st 2005 by a group led by the ING-IAC astronomer Javier Licandro1 using the William Herschel Telescope (WHT) and the Telescopio Nazionale Galileo (TNG) simultaneously showed that the recently discovered trans-neptunian object (TNO) 2005 FY9 is very similar to Pluto. 2005 FY9 is the third brightest known TNO, after 2003 UB313 and Pluto. Although discovered early in 2005 by USA astronomers M. Brown and co-workers, the discovery wasn�t reported until July 29th. 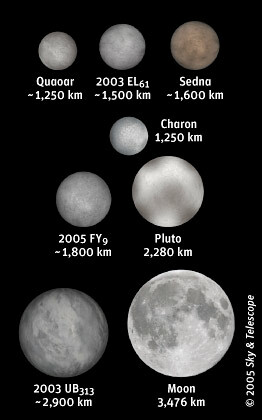 The size of 2005 FY9 is 0.7 times that of Pluto approximately. The semi-major axis of its orbit is 46 Astronomical Units (AU, 1 AU=149,597,892 kilometres), the perihelion distance is 39 AU and the inclination of the orbit is 29°. These values are typical of the classical TNO family. Visible spectroscopy was obtained using the ISIS spectrograph on the WHT, and near-infrared spectroscopy was obtained using the NICS spectrograph on the TNG. The complete visible and near-infrared spectrum is shown in Figure 2 and compared with the spectrum of Pluto and that of pure methane ice. Figure 2 clearly shows that the spectra of both TNOs are very similar. They are dominated by strong absorption bands produced by methan ice. In fact, the absorption bands in the spectrum of 2005 FY9 are deeper than in the spectrum of Pluto as a result of the larger abundance of methane ice in 2005 FY9. Also the colour of the surface of the TNO is red (indicated by the slope of the spectrum), similar to that of Pluto. This shows the presence of complex organic compounds in the surface. Licandro et al., 2006, A&A, 445, 35L. Identificado un Pariente muy Cercano de Plutón. IAC press release, 19 January, 2006.